Skip to Pet Assure video Skip to customer testimonials Skip to how Pet Assure works Skip to what's included in the discount Skip to Pet Assure savings on common vet procedures Skip to Pet Assure benefits Skip to what would you like to do next? No deductible and no waiting period!!! I had two yorkies. Spay & neuter on both done same day. The bill was $800. I showed my Pet Assure card and it reduced the bill by 25%. Awesome! I had just enrolled, no deductible and no waiting period!!! I am so happy! Pet Assure saved us hundreds of dollars on my rescue dog's luxating patella surgery and we were able to get high quality care at a hospital that accepted the card. It has already paid for itself in the first months of using it. I'm glad I signed up for Pet Assure. It has already paid for itself in the first months of using it. It was fast, easy, and I was able to use it the minute I signed up. I recommend it to many others. No filing claim forms... just instant savings. It is nice receiving a discount on vet visits....just show them my card, and the discounts are applied immediately. No filing claim forms....just instant savings. Having Pet Assure is better than having run of the mill health insurance for my dogs. There are no questions asked and my discounts are automatically calculated on my invoice. I've more than paid for the yearly membership fee in just a few visits to my vets. Enroll your pet. It takes less than 2 minutes! What's included in the discount? 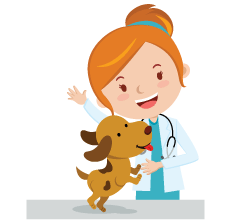 No forms to fill out - the veterinary practice gives you the discount right at the time of service! Enroll all your pets for free in our 24/7 lost pet recovery service. Get additional discounts on boarding and more! 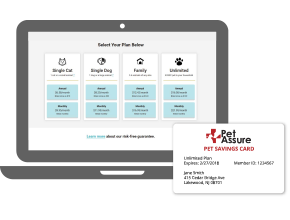 Sign up for Pet Assure today to get instant access to additional discounts. Every in-house medical service is covered, even pre-existing conditions. 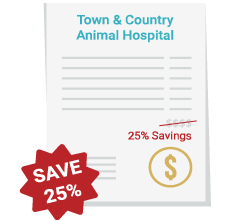 Please note: You cannot combine the discount with other discounts and service packages, and there is no discount on non-medical services such as routine grooming and boarding, outsourced services such as blood work sent to a lab or an outside specialist, mileage fees and products taken home such as medications and food. We are unable to locate your account at this time. Please contact us at 888-789-7387 so we can help you locate your account.